Blue Two-Tone Sword and Throwing Knives Set | BUDK.com - Knives & Swords At The Lowest Prices! This is the complete package! A set of three full tang blades is what you are getting. 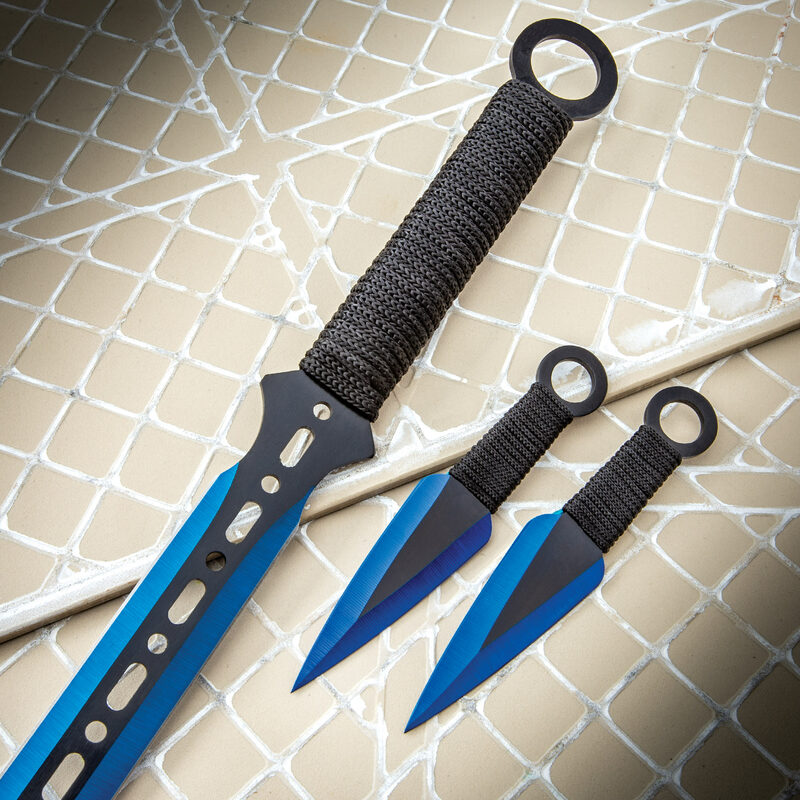 The sword and the throwing knives are constructed of rust-resistant stainless steel finished in black and blue. 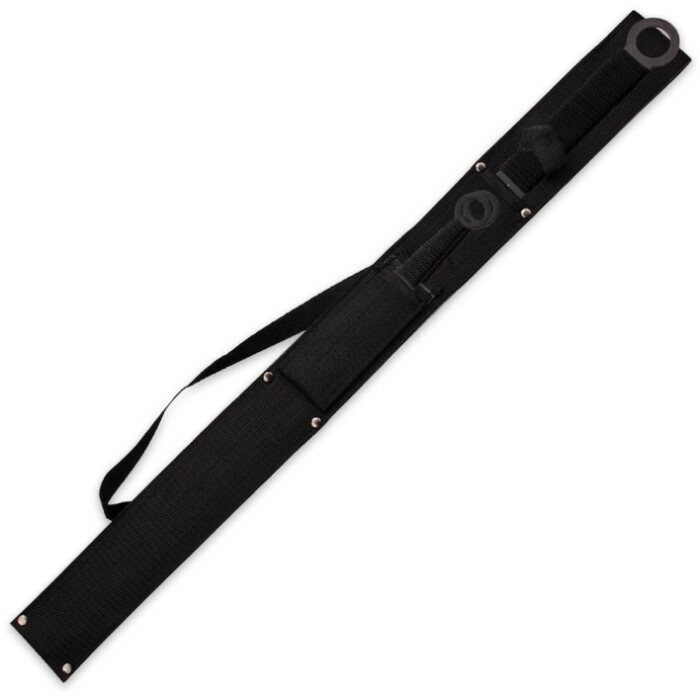 All of the handles are cord-wrapped for a secure grip when using them. The sword is 28” overall, and the throwing knives are 6” overall. A nylon sheath is included. Bought it to store at my crappy fixer-uper of a 1st house while I did the repairs necessary to move in. Made me feel safer as a young woman spending a lot of time alone on an otherwise empty property. Still, it's a very cheap piece and the throwers are basically decorative. When I needed something on the cheap to make a point visually it was great. Now that I've got the place fixed up I still keep it close, but I've got others I trust more nearby as well. Still, as my Minecraft ServerLord always says... "No such thing as too many extraneous backups." Like the last reviewer, I like short swords, so I had to buy this. The sword is thin, not a lot of chopping power but it is very sharp and penetrates well. 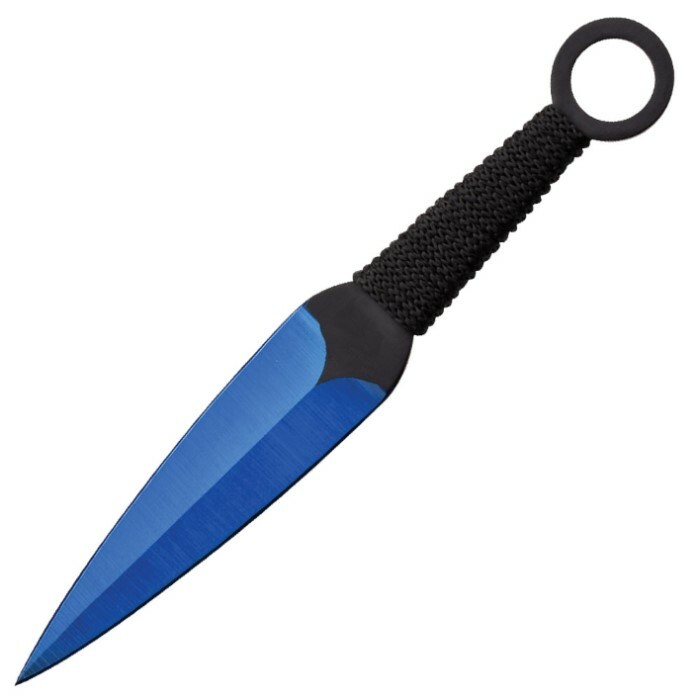 The cord handles on the throwing knives came off immediately, and as stated by the last reviewer the knives are too light to work well. My biggest complaint and reason for 4 stars, is like most of the "value" knives/swords sold by Bud-K and it's derivatives, the sheath is low quality. I have threads coming out all over the place and the stitching that holds the shoulder strap came out immediately. Called customer service and replacement is on the way .. At least the customer service is solid! #1... At this price point ($20! ), none of the following is really a "complaint", just observations. I like mid-short swords. Gladius, wakizashi, etc. This "sword" looked like a fun add on. So, to the review: The sword is almost too light to use. It is made of stamped and ground steel quite literally 1/2 the thickness of my Honshu Boshin Wakizashi. The cord wrapping on the grip is only one wrap, which is at least one to two wraps too little. In short, it is frankly unusable without adding a wrap or two of paracord. The throwing knives are also too light to have any real penetration.... but that's another story. The sword itself is nicely made and flexes reasonably. I would be most inclined to use it like a Rapier rather than a Cutlass as it really does not have sufficient mass for good slicing (plus, the edge is only 3/4 sharp... it will take some work to bring it up to even Honshu sharpness) It is very light and quick (see Rapier) and if wielded that way could be very effective. Out of the box I think it is a reasonable Fantasy/CosPlay blade, but not a "fighting" blade... even in the modern milieu. But, again, for $20, I really can't complain about needing to do some work to make it "useful to me". This was a great item with only one problem. The sword and knives were not blue as they seem in the picture. They were more aqua colored rather than deep blue. Otherwise great product and great company!! BEST SWORD EVER! :) THANKS!